I told him yes, he can do weight training by all means. He then further asked me: “Just give me top three tips for weight training after 55.” As people normally asked me this question, so I promptly gave him three tips. When I came back home from the gym, I thought of penning down the top three tips and publish them on my blog for the benefit of all those who read my blog. Many individuals when cross 50, they abandon the idea of getting started on a weight-training program. But at this age, weight training is even more important. In this article, you will find top three tips that you should know when starting a weight training program after you are 50 years old. More or less weight training after you are 55 years old, whether male or female, can be just like that of any other age. (i) As you age, your strength and mobility decrease, balancing ability gets impaired and injuries might take a toll. (ii) All the above means, you need to realize your limitations and accordingly start slow with an aim to work back into full range of motion movements. (iii) To improve mobility, incorporate stretching sessions in the beginning or end of your exercise routine. (iv) Most important for the individual who are over 55 years is to not get hurt. At this age an injury is hard to recover from. Make sure to begin slow and gradually increase frequency, duration and intensity of your weight training. (i) Begin with body weight exercises focusing on basic movements. Squats, pushups, some light overhead pressing and dead lifts (just mimic the movement at first to practice correct form) to get you going. (ii) Focus on good form and listen carefully to your body. Don’t force any movement beyond your limits, if it causes pain. (iii) Begin with some hanging drills to improve your grip and shoulder strength. You may not be able to do even a single pull up right now but with practice you can make it possible. (iv) Don’t only work on curls and arms. Focus on the big muscles. Do the Squats, Deadlifts, Dumbbell Clean & Press and Farmer’s Walk. If you are over 60 years age, read here are the best way to do weight training. I don’t recommend the conventional old days approach of running 3 to 4 times a week. It not only breaks down your muscles, but exposed you to more injuries as well. You can get better results with a different plan. (i) Swap the old distance running for a twice per week sprint program. Sprinting is a relative term. To start with your sprints will be just a little faster than a jog. However, you need to be cautious with sprints because hamstring and foot injuries are possible. (ii) Sprinting is an explosive, strength gaining workout. It not only burns fat, but also helps build strong legs. Just visualize the physique of any world-class sprinter. They have muscular and powerful legs. (iii) Once you get accustomed to sprint hard without injury, move on to trying some super sets such as body weight squats followed by a 40-yard sprint. This will burn the fat and build tremendous lower body strength. Believe me weight training for a man or woman of over 50 years age is really possible, rather I would say it is a great plan to attain optimum fitness. (i) You can gain muscle at any age. (ii) You can shed pounds and regain your nearly old physique at any time in your life. (iv) Don’t wait any longer, get up and start today itself. 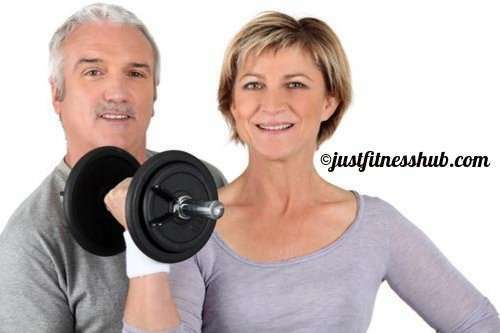 Please share your top three tips for weight training for seniors under the comments section below.